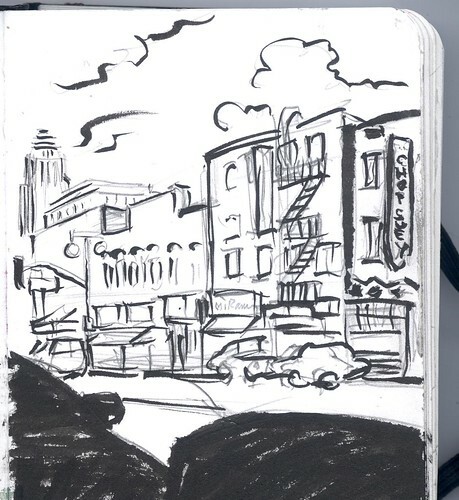 Here is part one of my sketches from Sketchcrawl 15 (and the first sketches to go into my newly modified Moleskine)! A small group of five of us (in all of Los Angeles!) managed to meet up in Little Tokyo in the midst of the Nisei Week festival. It was really lively, with bandstands and food vendors and people everywhere. There was so much going on that I didn’t know what to sketch next. It started out on E 1st Street, where we met in front of the tower at the Little Tokyo Village Plaza. This (above) is looking across the street with City Hall in the background and the renovated Chop Suey building at the far right. 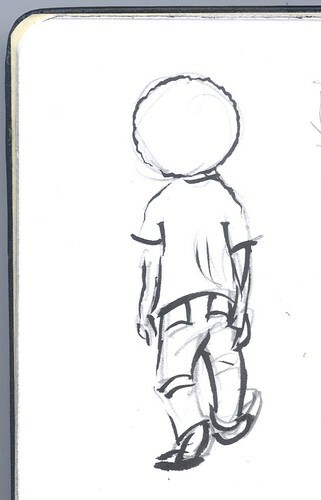 I sketched this kid with an afro as he passed by. It seems like sketching people in public often yields these angles from directly behind. 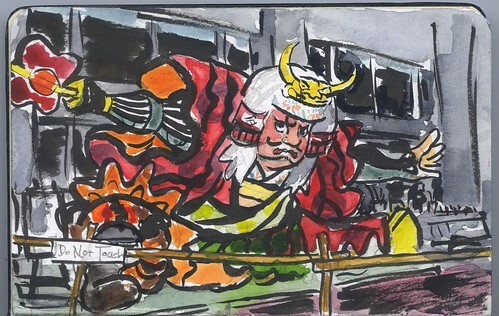 Did this one while in front of Yamazaki bakery in the Village Plaza. I saw this little old lady and just couldn’t pass it up. I realized her vehicle was like a little cherry sports car or something. Her whole appearance on this thing just cracked me up. 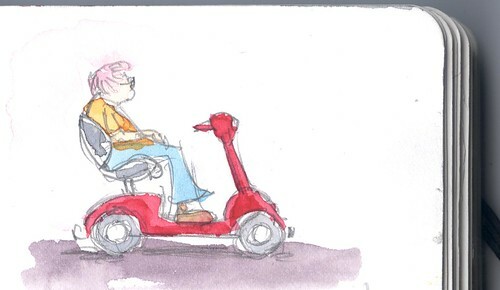 I heard the “Go-granny go-granny go-granny-go” part of the song Little Old Lady From Pasadena playing in my head. We made our way toward the cultural center building and I was stopped in my tracks by this giant. This is a float that I’m guessing was about 12 feet high or more and the exterior was made of paper. It had so much energy and character and vivid color. But I think I bit off a little more than I was willing to chew in a short amount of time. The pencil sketch I initially laid down had a certain energy and form that was lost when I then went in with the rushed ink. I would’ve liked to stay a little looser with the whole thing in retrospect. Gone in with expressive strokes of watercolor over the pencil and then just added accents of ink afterward where it would seem to need it. Still, I suppose all is fair in sketching, but sometimes less is more. I will post part 2 of my Sketchcrawl results tomorrow!